It’s a surname that’s fairly uncommon, even today. In 1850, fewer than 3,100 people were enumerated in the United States census with the surname of Battles — or any spelling variant of the name. By 1940, there were still fewer than 22,000 people enumerated in the census with the surname Battles. Since it’s a key surname for The Legal Genealogist, it’s a surname worth checking whenever and wherever a resource presents itself. Which is why I’m going to be spending at least some of my precious California visiting time in the next few days at the California Genealogical Society and Library after speaking at the society’s all-day seminar tomorrow in Berkeley. 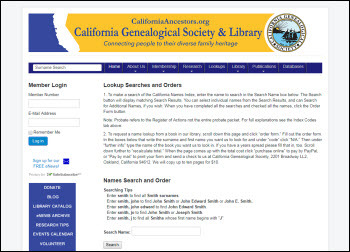 You can do a name search on the California Genealogical Society website and it’ll tell you if the name comes up in one of those reference resources, and what kind of data it is. You can then order the info; up to 10 pages copied and sent is $10. And when I did a search for the surname Battles, I got some intriguing hits. It looks like eight different people of that surname are in the records. There’s a biographical entry for Ella Frances (Hourhan) Battles, born in Ireland in 1870. Louise Maud Battles was a member of the San Francisco First Congregational Church in 1881. Luke Battles was born in Ireland in 1843, and was a voter in San Francisco in 1890. Nellie Battles was buried in the IOOF Cemetery in 1889. Edward Battles’ estate was probated in 1919. And there are three heartbreaking deaths: one-year-old Mary Jane Battles and three-year-old Margaret E. Battles in 1868, and seven-year-old Thomas Battles in 1886. Are any of these Battles folks related to my Battles family? But I’m sure going to try to find out. Along with the 20-plus folks surnamed Wiseman. Have you looked for your gone-to-California ancestor in the California Names Index?